Economic experts argue that Ugandas poor road network is one of the major bottlenecks to unlocking Ugandas economic potential.Road transport is, by far, the most dominant mode of transport in Uganda, carrying over 95% of passenger and freight traffic. The national roads currently make up about 25% of the road network but carry over 80% of the total road traffic.They also provide vital transport corridors to the landlocked countries of Rwanda, Burundi, Democratic Republic of Congo, South Sudan and to the Indian Ocean. 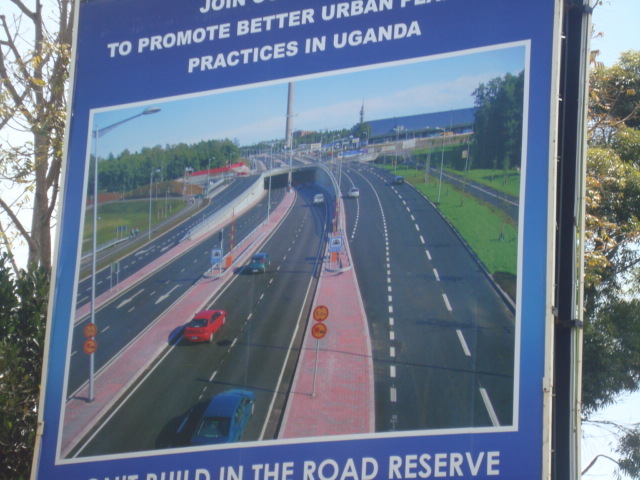 However, according to statistics by the Uganda National Roads Authority (UNRA), out of the 20,000km of the national roads, only 15% (2,914km) is paved or tarmac.Experts say if this poor road infrastructure is addressed, Ugandas economic potential will be boosted in both intra-regional and domestic trade.According to the countrys national budget 2012/2013, there are over 40 priority roads that are critical to the economic development of the country. China, like elsewhere on the continent, has come in to help.According to a Chinese saying, people who want to be rich should build a road first. Chinese companies are playing an important role in the infrastructural development of Uganda, Zhao Yali, Chinese ambassador to Uganda, said.In June this year, China delivered the first batch of road equipment to the Ugandan government as part of a 40-year soft loan of about $106m to boost the countrys road transport.While receiving the equipment that will be distributed to the various local governments in the country, President Yoweri Museveni said it would help in the construction of major roads. The equipment included 159 graders, 257 tipper trucks, 12 wheel-loaders, six bull dozers, seven excavators and two low-loaders.Zhao said the next batch of the equipment will be delivered in a few months.He said zonal service centers have been set up in several parts of the country to do the routine service of the machines.In order to make sure the equipment works well, China FAW Group will set up these centers in Kampala and five other stations in the main towns to train local technicians and provide maintenance services, Zhao said. The expresswayConstruction of a $350m Chinese-funded Kampala-Entebbe expressway is expected to start soon as the Government, the contractor, China Communications Construction Company Ltd (CCCC) and other stakeholders finalise the procedural stages.The funds to construct the 37km road are from a preferential loan from China Export and Import Bank.The road, which is the second of its kind in eastern Africa after the one in Ethiopia, still constructed by the Chinese, will be linking the capital Kampala to Entebbe International Airport, the countrys main gateway to the rest of the world.The total length of the main road is about 37km and the spur road from Kajjansi to Munyonyo is about 13km. The road is a standards expressway," said Zhang Weidong, project manager of the Kampala-Entebbe Expressway Project. "We used Chinese specifications and standard. It is four lanes double way.Construction of the road will take five years and CCCC has given a guarantee of six years.This road will play a very important role in Ugandas development particularly in tourism and will ease the traffic pressure, said Zhao.Another major road linking the western Ugandan town of Fort Portal to Ntoroko, Bundibugyo and then Uganda-eastern DRC common border is being upgraded by a Chinese construction firm Chongqing International Construction Corporation. The money being used to construct the 103.6km road is a loan from the African Development Bank to the Ugandan government.The road traverses land with the high potential for agricultural production of bananas, cassava, cocoa, palm oil and natural resources such as oil reserves, which recent studies and drilling have confirmed to be economically viable to exploit in the region.The upgrading of the road to bitumen standard is considered to be important, not only in terms of completing the national paved road circuit, but also for international transit traffic to the DRC, in addition to providing another important access to Ugandas section of the great western rift valley. The upgrading of the access to Semliki National Park with its Sempaya Hot Springs is expected to boost the countrys primary tourist destination, where the Kabalega Falls, the Lake Albert, Edward and George and the plains contrast with numerous crater lakes, mountains and other wildlife.Other Chinese road construction firms are involved in various projects across the country.Apart from improving Ugandas road network, the projects employ thousands of Ugandans and put money back into the Government through taxes. Sisi siasa nyingi kuliko matendo. kwani museven ana hoteli ngapi mbugani? Ha ha ha.. Wakenya wanasema Watanzania tunaongea sana.. Hawajakocea.. Nakumbuka Presidaa alianza kuzungumzia kuhusu fly overs toka 2005.. Imagine that..! Tatizo ni crics wengi kutosafiri ndani ya nchi hii. Mimi mdau wa safari. HataKenya wanakubali kuwa kwa barabara Tanzania ni kiboko. Hivi ninapo tuma posti hii naona kwenye dashbodi dereva anaminya 120kph, Singida-Dodoma, huku mi naandika kwenye ipad. NB mnaotoka kipande hii kuna mvua kubwa inanyesha in th distance. Kikwete angeanza 2005 leo hii Dar Chalinze ingekuwa nusu saa. Kinana aendelee kushangaa bei ya korosho,akimaliza aje ashangae na hii kitu ya waganda,then akakague mzigo wa meno ya ndovu melini kwake unaondoka lini.......inauma sana kuwashabikia magamba. Si JK alituahidi kuijenga Mwanza kama Califonia na Kigoma kama Dubai...........................!!! Wanafikiri tumesahau!!!?? Umeonyesha upeo mdogo sana wa kufikiri brazaaaa! Yeye kuwa na mahoteli kunahusiana nini na kinachoongelewa na mleta mada? Yani hata kama angekuwa na hoteli hadi guest house mia lakini kwa kiwango cha hiyo project ya barabara inatosha sana kumpa sifa yake babu!!! wewe ndio umesema, watu wengi humu wana matatizo na ni wabinafsi kupita hata hao viongozi wa CCM wananowachukia, kusema ukweli likija kwenya swala la barabara hakuna mtu anayetufikia ktk hizo nchi zote za AM nimesafiri sana Kenya mpaka Turkana nimefika, hakuna barabara kabisa, sisi karibu nchi yetu yote inaunganishwa na lami, lakini watu wa JF wanataka tu waone flyovers Dar ndio waridhike, kama sio ubinafsi ni nini? Kwani sisi serikali yetu ingesema hatujengi barabara mikoani tunajenga flyovers Dar wangeshindwa? Asante sana mkuu kkwa kuwaambia ukweli hao maJfdema. Wengi wao kusafiri ni mpaka mwisho wa safari ya daladala. ..tatizo siyo kwamba JK na CCM hawafanyi kazi, wanafanya but at a snail's pace. ..hebu fikiria tatizo la umeme lilianza tangu JK ni waziri wa nishati, mpaka leo hii bado hatuna uhakika kama tutapata ufumbuzi. ..miradi ya barabara kwa nchi nzima ilitakiwa iwe imekamilika sasa hivi. ..tulitakiwa tuwe kwenye masuala ya treni za mwendo kasi, na bandari zetu ziwe ndiyo port of choice ktk eneo la maziwa makuu. ..Tanzania tunatakiwa tuwe viongozi ktk eneo hili, siyo washika mkia. tuna rasilimali nyingi sana, pamoja na ardhi nzuri. ..na viongozi nao inaelekea wana mawazo mgando. ..umemsikia Dr.Kigoda anajigamba kwamba viwanda havijakufa, eti tuna viwanda 700++. ..the truth is hivyo viwanda 700++ havitoshi. wanetu wanazagaa mitaani kwa kukosa kazi, na waziri halioni hilo.